MANILA, Philippines – After a very successful silver finish in the recently concluded William Jones Cup in Taipei, the Gilas Pilipinas Men’s National Basketball Team is nearing its top form in anticipation of the upcoming FIBA Asia - Olympic Qualifiers in Hunan, China starting on the 21st of September until October 3rd this 2015. Minutes before the Azkals vs. Uzbekistan kick-off, Samahang Basketbol ng Pilipinas (SBP) along with National Team Head Coach Tab Baldwin, released the Gilas Pilipinas 12-man official roster that will be submitted to FIBA Asia officials tomorrow. As expected, naturalized Filipino Andray Blatche, who has just arrived from the US to attend his uncle’s funeral, made the cut together with PBA Veterans: Asi Taulava, Dondon Hontiveros and Sonny Thoss. Gilas 2.0 holdovers: Ranidel de Ocampo, Marc Pingris, Gabe Norword and Jason William-Castro. New comers: Matt Ganuelas-Rosser, Calvin Abueva, Terrence Romeo and JC Intal who surprisingly made the cut. 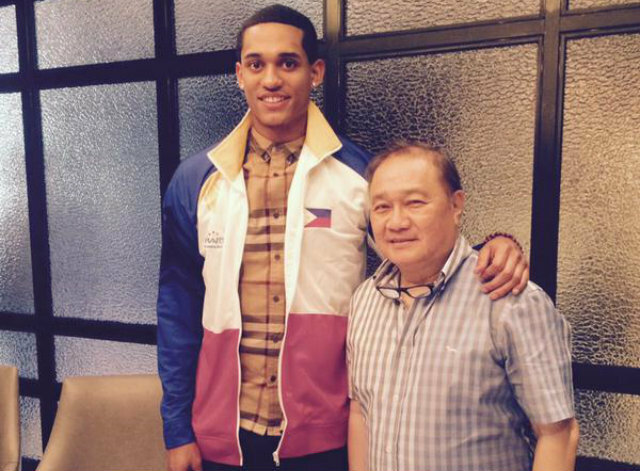 It was earlier reported that another Fil-Am and LA Lakers Guard Jordan Clarkson will join the team in Hunan, China. 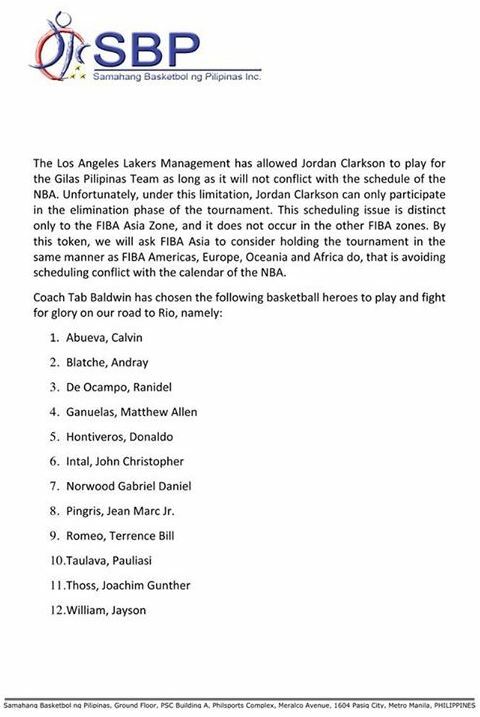 But the Lakers management only allowed Clarkson to play in the 1st round of the tournament and needs him to be back on September 28 for the mandatory team training camp in preparation for the season opener in November. 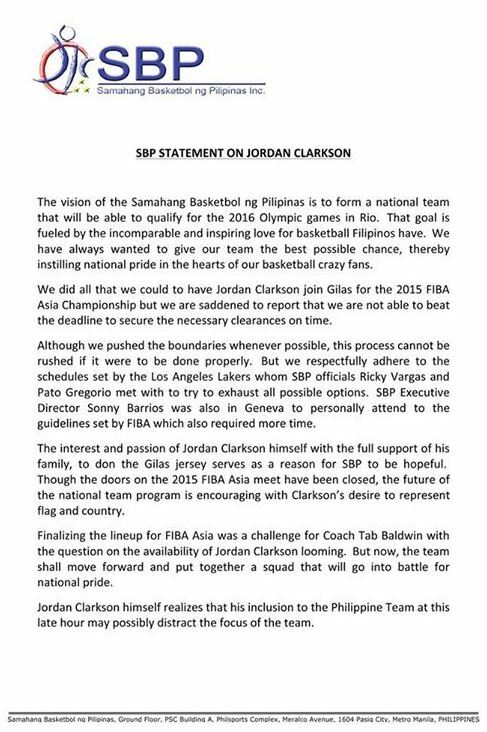 Clarkson who is eligible to play for Pilipinas National Team by meeting the ultimate FIBA requirement or “Hagop Rule” i.e. “All players must have a local passport of the country that they are representing before the age of 16” expressed his intention to play for Team Philippines for the next 10 years has been officially excluded from the 12-man player list. Just like Jordan, 4 more players who participated in Europe Pocket Tournament and Jones Cup were cut. Jimmy Alapag re-injured his quadriceps midway of Jones Cup, personally begged off due to his injury and will need more time to heal and get fit. Moala Tautuaa, Talk ‘N Text’s 1st draft choice in this year’s draft is considered as a Naturalized Filipino for not securing his Philippine Passport before he turned 16. He served as Andray Blatche’s back-up in case that the latter will not be able to make it due to serious injuries or other valid reasons. Gary David and 2nd draft pick Troy Rosario were also cut due to their recent subpar performances. Coach Tab Baldwin will have one more tournament to play before they head to Hunan China in less than 3 weeks. Gilas Pilipinas will be part of the inaugural MVP 4-Nation Basketball Tournament with Chinese Taipei and New Zealand whom we beat in Jones Cup plus Talk ‘N Text Tropang Texters who will replace Team Lebanon who backed out early this week. The MVP Cup will commence on Friday, September 11, where Gilas will face Moala Tautuaa, Troy Rosario and the rest of the Tropang Texters at 7pm.